According to my concert program, the fireworks were produced by Pyro Spectaculars. Credits: Eric Tucker, choreographer; Jon Berson, general manager; Bernie Dugan, technical production coordinator; Dale Offerman, chief pyrotechnician; Esther Offerman, Donald Goldman, Phillip Giroir, and Mark Corbett, pyrotechnicians; Paula Craig, logistics coordinator; and Paul McKinley, local pyrotechnic coordinator. The three barges are loaded with about 12,000 shells and other devices; it took four days to load the explosives. 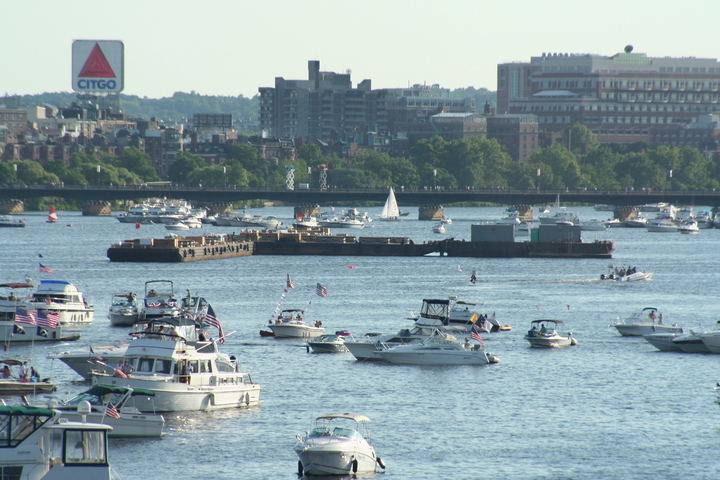 The size of the barges is limited by the locks on the Old and New Charles River Dams. Copyright 2005, Garrett Wollman. All rights reserved. Photograph taken 2005-07-04.